I was a foot soldier in the Reagan revolution. I eagerly campaigned for him on both coasts in both of his presidential races and served proudly in his administration. With the recent CPAC meeting in Washington, D.C., I was led to re-read Ronald Reagan’s 1977 CPAC speech . It was a gem. He spoke of a New Republican Party, a party that welcomed new members and sought to build a majority in the country. What’s especially interesting about Reagan’s 1977 CPAC speech is what he did not say. He did not cast blame for the disaster of Watergate, the Republican rout in the 1974 mid-terms, or the tossed-away opportunities of 1976. Reagan was relentlessly upbeat and positive. Reagan was intent on building a new majority. He was an expert in “outreach” before the GOP employed the term. Reagan had been riding the rails for 20 years as a “pitchman” for GE. The media used that pitchman description as a putdown. But Reagan, as he so often did, turned it to his advantage. When you are selling a product, you need to learn what sells – and what doesn’t. He had perfect pitch. That’s why Ronald Reagan invented the “Eleventh Commandment.” He spelled it out for reporters. When they came to him with sharp criticisms from other Republicans, Reagan would genially wave them off with this explanatory note: “Thou shalt not speak ill of any fellow Republican.” That’s what he always said. No one ever heard of this so-called commandment before Ronald Reagan. And no one, seemingly, has heard of it since. But what he achieved with it is truly amazing. When Reagan sought the Republican nomination for president in 1980, his main opponent, George H.W. Bush, said his tax cut proposals were “voodoo economics.” Reporters took that barb and raced to get Reagan’s reaction to it. You can rely on it: Anytime one Republican gets into a fight with another, the reporters will happily hold both coats. 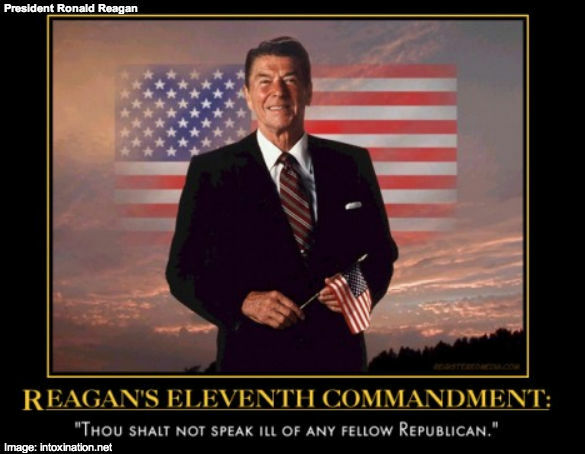 Reagan simply smiled and invoked his Eleventh Commandment. He ignored the criticism. And thus he ignored the critic. Now, Reagan knew that the supporters of each of his six opponents in 1980 – George H.W. Bush, Howard Baker, Bob Dole, John Connally, Phil Crane, and John Anderson – would be needed in the fall against Jimmy Carter. He didn’t want any of those backers of rival candidates to be embittered toward him. So he gave them no excuse to go fishing on Election Day. He was reaching out to Independent voters. Reagan knew that Independents absolutely hate partisan bickering. It’s one of the reasons they are Independents. By not attacking other Republicans, Reagan avoided getting into the gutter of “so’s your old man” petty politics. Finally, Reagan the former Democrat knew that lots of Democrats are conservative, but they don’t much like Republicans. By not engaging in backbiting with other Republicans, Reagan was able to appear to these conservative Democrats as someone different from other Republicans. Which he surely was. On Election Day, Reagan won 85 percent of Republican voters and 27 percent of Democratic voters. And Independents, especially those who decided in the last week before Election Day, went overwhelmingly for Reagan. He carried 44 states that time. And there were no Red States or Blue States. To Reagan, all our states are Red, White, and Blue. Re-reading his CPAC speech of 37 years ago, I’m amazed at how fresh and current it sounds today. That may be because, as George Will rightly said: Reagan spoke to the future in the accents of the past. That’s a leader. That’s a statesman. That’s a winner.